It started with a slightly scratchy throat on Christmas Eve. I drove up to see a good friend who lives north of Louisville that day, and warned her as I stepped in the door that I was coming down with something and was probably contagious. She made me a cup of tea with honey, and that was the last I thought about being sick during our visit. By Christmas night, the scratchy throat was joined by chest congestion, which is not the usual cold progression for me; normally a cold will start as sinus congestion first, then move down into my chest. This time I started coughing long before the sneezing and nose-blowing stage, which hit me full-force on Wednesday. It snowed that day, and I stayed close to the fire, crossing off all but the most necessary items from my daily to-do list, and bundling up well for pasture rounds. By Thursday, my chest was aching and I could feel a deep congestion settling into my bronchial tubes, something I’ve not had in quite a long time. As an ex-smoker, I expect residual damage and weakness in that area, but since quitting 18 months ago I haven’t had any serious chest colds. This one would break that streak. But I didn’t know that yet, so Thursday afternoon I bundled up and got a little exercise, cutting up a downed sassafrass tree at the edge of one of the pastures, to add to my firewood stash. My standard response to cold symptoms these days does not usually involve masking symptoms with pharmaceuticals. Mostly, I think, because I’m too cheap to spend the money on the stuff. Unless I’m aching so bad I can’t sleep, I won’t take pain killers; I really don’t like the way antihistamines artificially dry out the sinuses, and cough syrup that either inhibits or promotes expectorant just doesn’t make any sense to me. Granted, I don’t have to go to a workplace job and interact with other employees or the public, so the snottier aspects of being sick are just between me and my kerchief. Other than common sense measures like keeping my head and feet warm, drinking lots of liquids, and slowing down to let my body fight the bug, the only additional support I employ is a high-dosage of vitamin C powder dissolved in water, taken throughout the day. I have found this helps my body’s response efforts and shortens the duration of the cold. I’ve never done a double-blind study to prove any beneficial effects, but it’s cheap and non-toxic and I figure it can’t hurt. The major drawback to not masking symptoms with drugs, though, is you have to experience the symptoms. But they don’t last forever, and my colds move through me much quicker now that I’m not inhaling smoke and toxins on a daily basis. And usually I don’t find the “I’m sick” stuff – the sneezing, nose-blowing, coughing – to be overwhelmingly decapacitating, just annoying. But the chest congestion that came with this cold, I swear it nearly killed me Thursday night. I will spare you the phlegmy details, but suffice it to say, I didn’t sleep much and thought a couple of times I needed to be intubated just to keep breathing. Heavy stuff. Worst crap I’ve had in my bronchi in a long, long time. Kind of scared me, actually, the not being able to breathe part. So yesterday I took another sick day, and crossed the project of spreading gravel with the tractor up on the hill before it rained off my list, and stayed close to the woodstove all day. It was crappy weather, mid-thirties, spitting rain: I didn’t need to push myself any further toward the cliff edge. So today, I feel much better, and the congestion is loosening and lightening, and my energy is back. I’m recovering. I warm my tootsies in front of the stove every time I come back in from pasture rounds, I wear a hat every time I step outside even if it’s just to take the dogs out for a pee break, and for one more day, I left the extra outside projects off my list. They will get done in due time. I’d rather be getting better and be behind on my winter projects, than the other way around. So sorry you’ve been sick, but glad you are feeling better. We quit smoking at about the same time, apparently, me in July 2011. I did the electronic cig for a year, but quit all nicotine for good this summer when Sarah and I went to Maui. Not easy, but I’m done. My boyfriend Scotty smokes, much to my dismay, but the electronic cig is in his future. :-). Thanks Mark – I’m glad to be on the upswing for sure! Hate being sick. Yes, I quit for GOOD as a 50th birthday present to myself, in May of 2011. (Uh-oh, now the math is out there…) I used both the patch and the gum, a double-whammy protocol the Navy folks were pushing before prescribing the more expensive I-forgot-the-name-of-the-drug. It worked because I really wanted to be a non-smoker, and I drew the line in the sand for myself. My husband still smokes and wish there were a way to get him to the quitting point too. You’re right – it’s not easy! I have a lot of empathy for smokers who haven’t quit yet but know they should. Sorry you’ve been so sick, Kay, but glad to read you’re on the road to recovery. 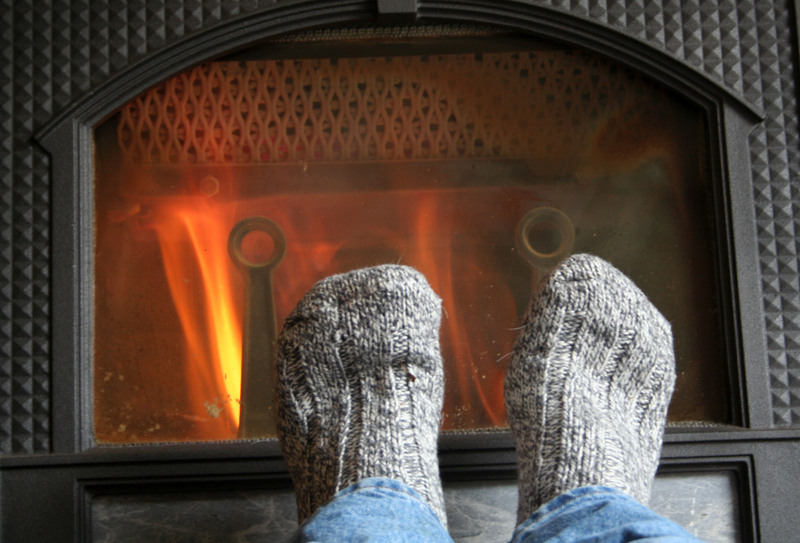 Really like that photo of warm socks in front of the wood stove. Thanks Sylvia – I hope I’m back to normal within a week. I don’t know what I would do without my wood stove! A better use, imo, of that sassyfrass tree would be to make tea…would help your immune system as well. Also, Sambucol and elderberry juice concentrate…I take 2 tbl of Sambucol, daily, and about 3 to 4 times a year, buy a pint of elderberry juice concentrate and make a half gallon. Over the course of a week or two, I’ll drink the juice; haven’t been sick since 12/10…thank the good Lord! Sandra, great suggestions, I’ll look into both Sambucol and elderberry juice. Two years without being sick is a great testament! The tea-making part of sassifrass is the root, as I understand it… I’m going to look into that, as well, as I have lots and lots of sassifrass trees, small and large. The wood actually splits easily (so it makes great kindling) and burns well, although it doesn’t leave lasting coals like the hickory does. I’m mixing species to get the best of both worlds. Looking forward to more stories from the farm and Happy New Year! on January 8, 2013 at 3:04 pm | Reply CarolG. If you want to make sassafras tea you can also use the inner bark. I got a fantastic supply years ago when a farmer friend of mine pulled out the tree roots with his tractor while clearing a pasture. The large roots chip up for tea really well.